» The interface is pretty clean, very fast and intuitive. 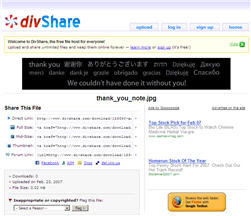 » DivShare automatically creates an image gallery of all the pictures that you upload to their web servers. Now, here's some great news for bloggers, especially those who are on the Wordpress platform. You can host your files on DivShare and link them in your blog posts. That saves precious storage space on your server and since the files will be served from DivShare, you save on those monthly bandwidth bills as well. Co-founder David Altschul just informed that DivShare has launched a Wordpress plugin that allows you to upload files directly from your "Write a Post" page to your DivShare account, and insert them into your post with a single click. Wondering what's their business model ? Not sure but are already using Adsense to monetize their website and who knows, a pro version may be in the works for uploading files even greater than 200 MB.